The best of all worlds, ConnecTec Cat delivers a simple to terminate, flexible, and solid category cable connection… all at the price point you need for your entire system. ConnecTec Cat’s high quality collection of plugs, jacks, and keystone inserts are fully ANSI/TIA-568 Compliant & UL approved. ConnecTec Cat is ready to support shielded and unshielded category cable needs, offering Cat5e, 6, 6A &7 connectors and tools that makes 90 second successful and high quality terminations a reality!! ConnecTec Cat is ready to support daily needs in Data Centers, AV, HDBaseT, LAN, and many other applications. Ready to make life less maddening? 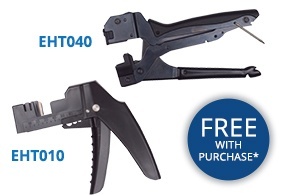 Free Tool with Qualifying Purchase! Easy to Terminate: less than 1-2 minutes on average!